In a small Montana town, three women are facing crises large and small. One is a lawyer with a troubled client, another is seeking to build a family home, and the third is a horse rancher looking for companionship. Reichardt “confirms her status as cinema’s foremost poet of the American Northwest” (Screen International), excelling in careful observations of women’s emotions and relationships. In a superb cast, newcomer Lily Gladstone, as the rancher, is a worthy match for her highly celebrated co-stars. 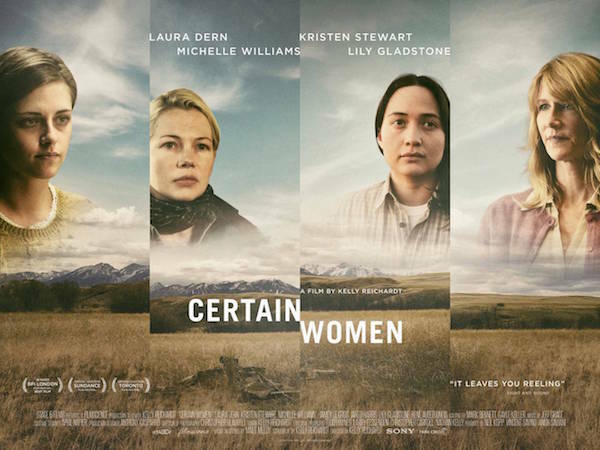 Certain Women was awarded Best Film at the 2016 London Film Festival.